Fly strike, although more of a problem in sheep, does occur in Angora goats in South Africa. 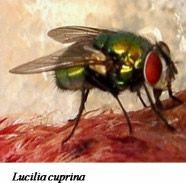 The green blowfly ‘Groenbrommer’ (Lucilia cuprina) is responsible for most fly strikes (about 90%) in Angora goats. 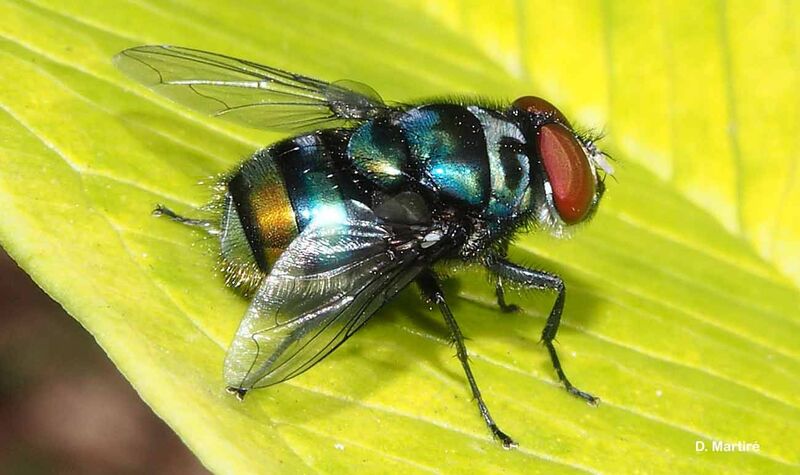 Chrysomyia chloropyga the Copper tailed blowfly also known as ‘Koperstert-skaapbrommer’ is responsible for about 10% of cases. 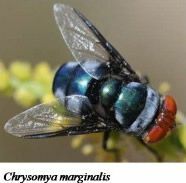 ‘Bloubrommers’ Chrysomyia marginalis do not cause fly strike in goats that are alive but feed on dead animals. Chrysomya chloropyga Copper tailed Blow fly. The striped blowfly ‘Gestreepte groenbrommer’, Chrysomyia albicans, is a secondary blowfly maggot as it feeds on the primary maggots. It only lays its eggs once the primary strike has occurred. After hatching the adult flies feed on the nectar of certain plants or the breakdown protein ‘soup’ of carcases. The flies may live for a month or more. The adult flies lay eggs in batches of 100-150 (total 3000). These eggs hatch in 8-12 hours. The pupation period may be 7-10 days in summer but several months in winter. What do the maggots feed on? The primary maggots feed on the superficial skin of the goat. These maggots secrete a proteolytic enzyme which leads to a certain amount of liquefaction of the superficial tissue causing inflammation and exudation. This attracts further Blowfly which lay eggs and these maggots then enlarge the wound and burrow more deeply. What clinical signs do the goats show? The goats do not eat properly. If the strike is in the breech the tail will is waggled and the hind feet are sometimes stamped. 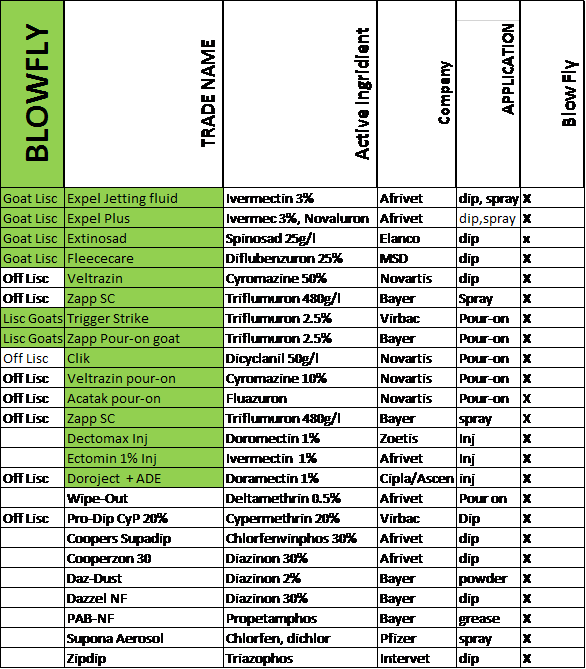 The goat may bite at the area of blowfly strike. There area is clearly visible and will have a distinctive smell. The goat will ultimately die due to the high ammonia content of the maggot’s saliva which will cause a toxaemia. 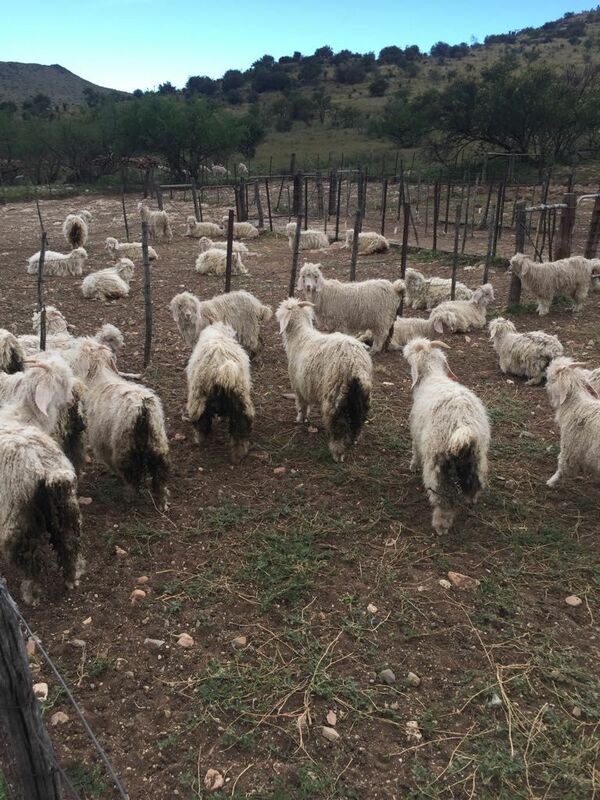 GREEN is the list of products recommended by SAMGA to avoid residues in Mohair. What preventative treatment can be done?